Bruce Gentry was an adventure comic strip, syndicated by The New York Post, that was either a decade or so behind the times or a couple of years ahead. Either way, it missed the boat. Brick Bradford had started out that way, too. But their heyday was before World War II, and Gentry started on March 25, 1945, when that war was in its final months. 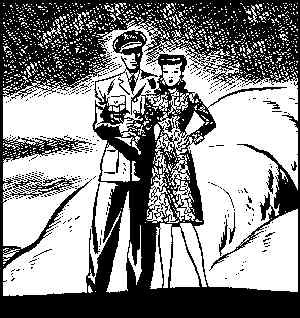 The strip's most obvious precursor was Milton Caniff's Terry & the Pirates, which had taken on a strong aviation slant a few years earlier, when its protagonist joined the U.S. Air Force. And there was good reason for the resemblance. Tho he'd been a sports cartoonist, comic book artist and animator (he worked on Fleischer's Betty Boop and Popeye cartoons), Bailey's best known earlier work was as Caniff's assistant on Terry and Male Call. His drawing style was strongly reminiscent of Caniff, as was his method of putting together stories. Bruce Gentry was a well-done strip because Ray Bailey had learned from one of the best in the business. The title character of Bruce Gentry was a former pilot in the U.S. Air Force, working for a small airline in South America. There, he found enough subversive and/or criminal activity to keep readers of the strip coming back, and enough gorgeous women to motivate a dozen heroes. But a single continent can't contain a good flying hero, so his adventures branched out all over the world — even, long before it became prominent in the news, to Vietnam. That's also a pretty good description of Steve Canyon, which Caniff launched a couple of years later. Bailey did a good strip in the Caniff tradition, but wasn't able to compete with Caniff himself. Tho Gentry came first, it was Canyon that went on to fame. Bruce Gentry went on to a comic book reprint series from Standard Comics (Fighting Yank, Supermouse) that lasted six issues, another of only one issue from Four Star Publications (Captain Flight, The Black Cobra), a movie serial from Columbia Pictures (Blackhawk, Jungle Jim), then nothing. On January 6, 1951, Bruce married Cleo Patric, steadiest of his many sweethearts. Marriage hadn't stopped Prince Valiant or Buz Sawyer, and would later fail to stop Kerry Drake and Brenda Starr, but it did stop Bruce Gentry. That was the final episode of the strip. Text ©2002-10 Donald D. Markstein. Art © New York Post Corp.